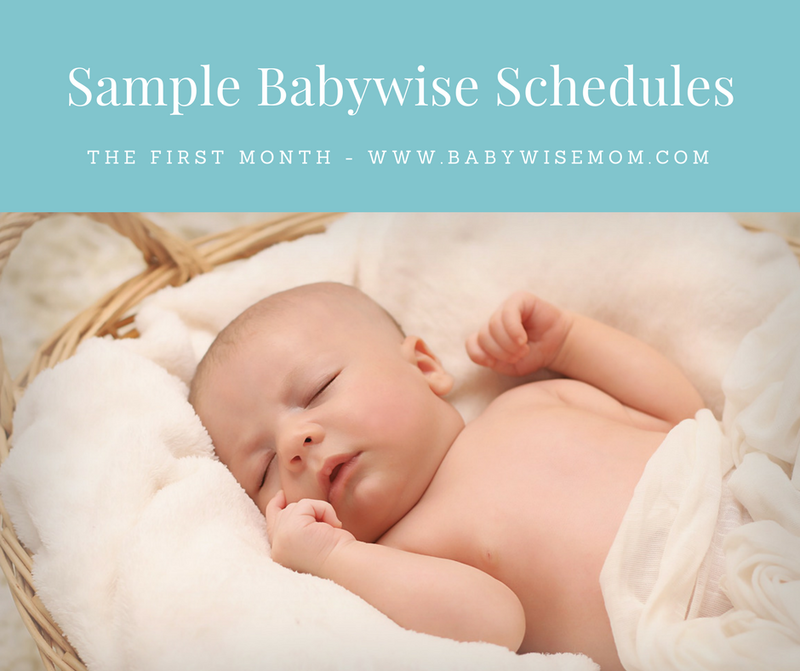 Sample Babywise Schedules for your baby’s first month. 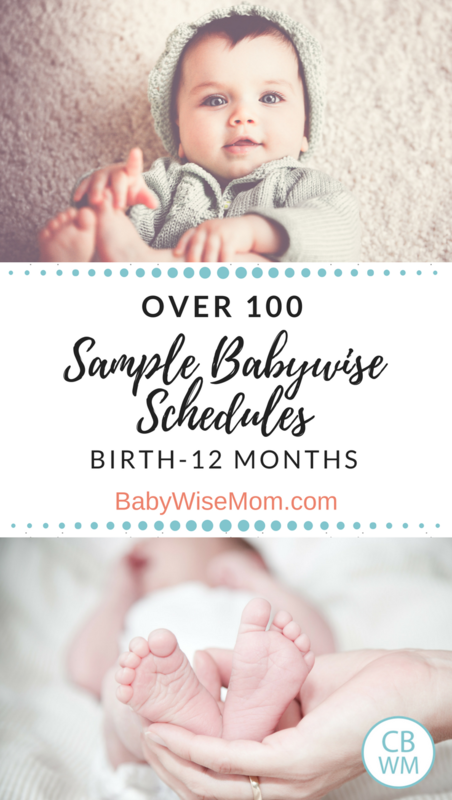 Babywise newborn schedules to help you get baby sleeping and eating well. Starting early creates a great routine for your newborn. The first month of baby’s life is the least scheduled overall in your Babywise journey. You “take the clock and turn it around” as the book says. In other words, you don’t worry so much about times as you do getting the whole family more acclimated to life with a new baby. There will never be a return to “normal.” There is a finding of a new normal. Here are some sample schedules from the first month of life. These are from me and you blog readers. Please feel free to add your own schedules in the comments. Before you go further, please be sure you have read My Sleep Hierarchy For Newborns. You need to know what your primary and secondary goals should be for a newborn so you keep priorities straight. It will make your newborn life much less frustrating! Feed 8-10 times per a 24 hour period. Feedings should be 2.5-3 hours apart typically. Cluster feeding can be helpful for a very hungry baby in the evenings or for a baby who needs to get more feedings in the 24 hour period. There will be a growth spurt around 3-4 weeks old. This will mean your baby will eat more often during the day and sleep less. It won’t last forever! Baby will nap 6-8 times per day. Naps should be around 1.5-2.5 hours long each time. Your baby can go up to 5 hours between feedings at night. Some will wake up more often than that, others will need you to set an alarm and wake them up at five hours to stay on track. 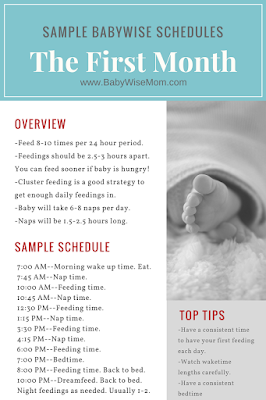 For a full year overview, see this post: Your Babywise Baby: First Year Overview. 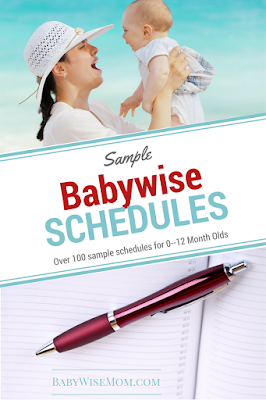 Read the entire On Becoming Babywise book here (affiliate link). Click to watch me talk out what to expect in this first month. While the book says to not worry about a schedule during this week, we had one with all of our girls. I am really big on “begin as you mean to go on.” I also found it hard to not do a schedule since that was ingrained into me by the time my girls came along. Another driving factor for me was that my girls didn’t wake up on their own most of the time. I needed to wake them up so they would eat. If I left them to guide the way, who knows if and when they would have tried to eat. My first focus was on an “eat/wake/sleep” cycle idea. I was aware, however, that often for a brand new baby, “wake” and “eat” might be one in the same. Newborns are sleepy and might just eat, sleep, eat, sleep, with little to no actual wakefulness in between. For help on proper expectations for awake time lengths, see this post (including an infographic on waketimes!). Another big focus for me was having a consistent time of day that we started each day. I started it when I hoped my baby to start as she got older. My babies did not all end up starting the day at my ideal start time–they were naturally inclined to start at a different time. Adjust your expectations as needed. Wake baby up at this same time each day to eat and start the day. If baby is waking up in the night close to this time, see my night wakings post for help to navigate that. I also really wanted my babies to be able to fall asleep independently from the beginning. I didn’t want to teach to fall asleep one way and then teach a new way later. My favorite way, a no-cry solution, is the Four S’s. Then you would have baby waking twice during the night to eat. McKenna ate at 9:50 PM, 1:30 AM, and 4:00 AM. I got her up at 7:45 AM. This was much better. She did have a gas pain situation this night, also, though. McKenna ate at 9:50 PM, 1:45 AM, and 4:45 AM. I then woke her at 7:45 AM. This was the night that I first had to wake her for a night feeding. I woke her at 4:45. I could let her go up to 5 hours, but I want to keep morning waketime as consistent as possible. I also need to have at least 8 feedings in her and she does better with a longer schedule in the day–resulting in needing two night feedings right now. McKenna ate at 10:15 PM, 2:15 AM, and 6:15 AM. I woke her at 8:15 AM. I woke her for all four of these feedings listed. McKenna ate at 10:00 PM, 1:35 AM (she woke for this), and 5:15 AM. I then woke her at 8:00 AM. The same rules and goals of week one apply to week two as applied in week one. 9:30–nurse. This actually can vary from 9:30-10:00 PM. I then went to bed. She typically woke on her own somewhere around 2 AM. I then woke her around 5:30 AM so she would still be hungry enough to eat at our first feeding in the morning. This is when you might run into a growth spurt. If so, feed more often. If not, stick with your basic rules. If the growth spurt didn’t happen in week three, it will in week four. Feed as often as baby needs this week. Need help getting baby to take great naps? Get my eBook The Babywise Mom Nap Guide here to establish great naps! This is so timely! We just had our fourth baby 8 days ago. I'm finding following a "schedule" from day one so much more important this time around because this is the first time we've had to juggle and new baby along with school & other obligations with our older kids. I'm struggling with getting this baby to sleep anywhere but in my arms. My old backups- swings, or putting him in the bassinet right next to me with my hand on his tummy- just don't cut it with this kid. With past kids I would have success when I timed things well (getting them in bed when they were drowsy but not quite asleep) but this guy is so tired he's pretty much always asleep. Lol. Anyway, I'm finding a bit of incremental success with focusing on what I can control. I can establish the waketime, the wake (eat)/sleep pattern, the nap/bed routine. Then I always try the crib, and sometimes it works and sometimes I resort to my arms or being carried in a baby wrap. Hopefully there won't be too much long term trouble. So far we've gone from not sleeping at all without me to about 50% success with a crib/bassinet. I'm hoping things will continue to improve so I can get some more ZZZs!